Place all ingredients in a container with a screw-on lid and shake until blended. 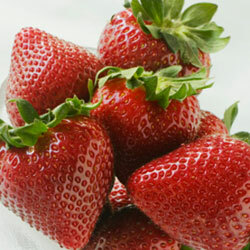 Wash the strawberries, remove the stems and cut into slices. Mix the dressing and strawberries and leave to stand for 15 minutes. Divide the strawberry slices between four serving plates. Mix the watercress, rocket and celery and place on top of the strawberries. Place the cheese and chicken on top, scatter the poppy or sesame seeds over the dishes and drizzle with the remaining dressing. Serve with fresh bread.